Yesterday I got an email, which was obviously a newsletter I signed up for, but the name of the person who sent it didn't ring any bells. Who was that person? What was their website about? When did I sign up for the newsletter? No idea. And then I thought, "Man, this is how my subscribers might feel like as well!" So let me quickly correct that. This is me, Gill Andrews, a content creator and a web consultant. And this is how I look in real life (Except of the lipstick. I don't know what I was thinking that day...). You are getting this email most probably because you downloaded my ultimate website checklist (either this PDF or this interactive mind map). I write to you once a week sharing a quick tip that (so is my hope) makes your life as a business and a website owner easier. Today, I’d like to show you a quick trick I use to improve the SEO of an existing page for it to rank better. Some time ago, Google decided they need to earn more money. So they made Keyword Planner’s exact data accessible only for the people who run payed ad campaigns with Google AdWords. Shortly after that, I saw many posts on how this is horrible, and what are the small businesses supposed to do know, and how Keyword Planner is now dead. Did you know that you can still access ALL the detailed information for just $1 a month? That sounds pretty alive to me! If you have an AdWords account (which is free) and have an ad campaign on which you’ve spent at least $1 a month (a month!) you will still see the detailed information the way it used to be before – exact numbers instead of ranges. Step 1: I've created an AdWords account (it's free) and set up an AdWords campaign for my website review page with the maximum daily amount spent being $2. Step 2: The first time (and after that, once in 30 days) I let my campaign run till the end of the day and check up on it in the evening. Step 3: If someone has clicked on my ad, it means I’ve spent more than $1 (but less than $2) already. In this case, I pause my campaign for the next 30 days, while enjoying all the detailed information of the Keyword Planner the way it used to be. Step 4: I repeat this from step 2 after a month as soon as it starts showing me ranges instead of exact numbers. Although I use other tools as well, Google’s Keyword Planner is still my go-to tool to mass-research the keywords and get the first impression of what is out there. Also it has this super important feature for me as a web consultant: It is the only (almost) free tool that offers local search query databases. Because if I have a client with a website in Dutch, for example, I need to do keyword research using a Dutch database, which otherwise only super expensive tools like SemRush offer. 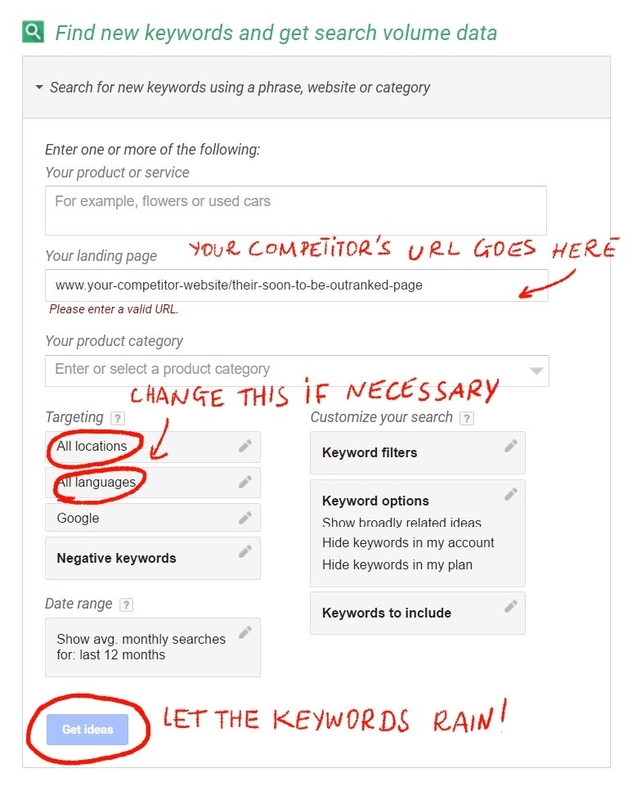 But my favorite thing to do with the Keyword Planner is to spy on the competition. Here comes the trick I use to improve SEO of an existing page for it to rank better. When I’m working with a client rewriting their copy and optimizing their sales pages for search engines (especially when I don’t know the niche well enough) I ask for a link to a competitor's page that outranks a page of my client. …and let those golden keywords rain! I then take the keywords which I think will help that page of my client rank better and optimize the page targeting a particular keyword and/or sprinkle semantically related keywords through the text. This is most effective when you have a higher domain authority than your competitor who outranks you. It means you already have an advantage. So if your page matches the searcher's intent at least as well as their page, and you optimize your page for search engines just as good as your competitor (you don’t even have to be better at this) - you win! Sneaky? Well, maybe just a bit. But totally legit. It even has a proper name: Competitor analysis. This would be all from me for today. Hope this helps. Enjoy your Friday and the coming weekend. You received this email because you've subscribed to my updates. Changed your mind? No problem! Click "unsubscribe" link below.